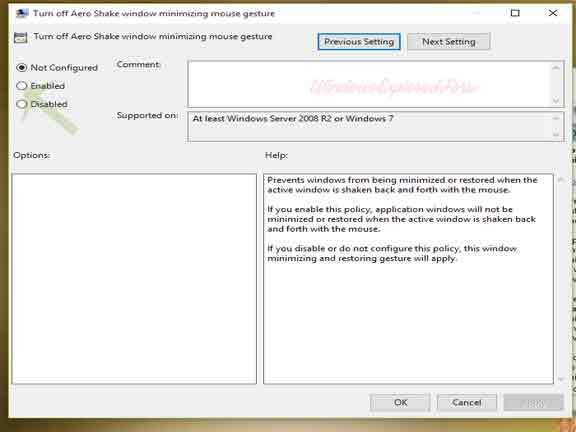 Enabling and Disabling Aero shake in Windows 10. What is Aero Shake ??? Minimize to Taskbar,Except the One We Are Using. How it is Useful ??? 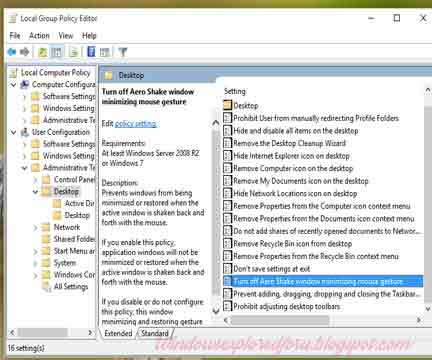 You need to do is Follow the Upcoming Steps As it is In Your Windows 10 PC. Step 1 : Logon to your PC As Admin. Step 2 : Press Ctrl + r keys All At Once. You Will be taken to Run Command. Step 3 : Type gpedit.msc and hit Enter. Step 5 : Select Desktop on left Pane. Step 6 : Click On Turn Off Aero Shake Window minimizing Windows mouse Gestures. Step 7 : A New Window Will Open Click On Enabled. Step 8 : Close the Windows. To Turn On Simply,Select Not Configured or Disabled.